The contemporary process of urbanization prevalent in the countries of the Global South, especially in Africa and Asia, is characterized by an unprecedented rise in urban populations, exceeding the capacity of local authorities to provide essential services. In particular, local authorities lack the funding required to build adequate infrastructure. One striking feature of contemporary urbanization is the growth in informal urbanized settlements, called “census towns” in India, “urban villages” in China, and “townships” in South Africa. Compared to India, China and South Africa have been able to turn around their cities and revamp them within 10 years. These countries present similarities and differences in managing and providing basic urban services. 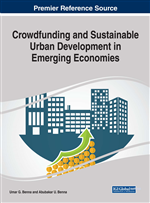 In this chapter, an attempt is made to analyze and compare the urbanization process in these countries and to identify some financial alternatives and policy implications to foster inclusive growth by integrating informal settlements into mainstream urbanization with focus on India. Contemporary process of urbanization is closely associated with the Global South, especially certain nations of Asia and Africa. The recently released, ‘United Nations report on World Population Prospect-the 2017 revision’ estimated that, in mid-2017, 77% of the world’s population lived in Asia and Africa. Currently, these two continents are home to 4.5 and 1.3 billion people respectively (UN, 2017:1). The world’s population is expected to rise by 2.2 billion between 2017 and 2050. During this period, Africa’s population will grow by 1.3 billion and Asia’s by 750 million (UN, 2017:3). Globally, Africa will experience the highest rate of population growth, followed by Asia, North America and Latin America. In contrast, Europe’s population is forecasted to decrease by 2050. The process of urbanization has been associated with development due to increase in economic opportunities. The traditional theories of urbanization such as ‘modernization theory’ postulate that technological developments release workers from agricultural activities, allowing them to take up industrial jobs in urban areas (Berliner, 1977; Bradshaw, 1987; Kasarda & Crenshaw, 1991; Dutt, 2001). The traditional urbanization as experienced in the Global North has been characterized by rural to urban migration. This ‘modernization theory’ explains the development in the Global North. Comparatively, the process of urbanization in the Global South has been different, which is due to not only rural to urban migration but also natural urban population growth as well as rural to urban reclassification (also called in-situ urbanization). The theory of ‘in-situ urbanization’ proposes that rural activities are superseded by urban activities without rural to urban migration between settlements (for China see Zhu, 2004: for India see Pradhan, 2013). Rural land adjacent to urban areas is converted into urban usage due to low price of rural land. The annexation of the rural areas into urban areas increases the spatial extent of the services infrastructure provided by the urban government. Due to lack of resources, the majority of such developments are not connected or provided with basic infrastructure. Urbanization process in the Global South is also characterized by a failure to generate sufficient formal jobs for unskilled rural-to-urban migrants, forcing them into informal employment. In India, for instance, economic development has not followed the traditional path from an agricultural-based economy to an industrialized economy and finally to a services-based economy. Due to the limited infrastructure for the supply of power and water needed by modern industries, as well as the lack of available developed land supply and environmental restrictions for industrial location in urban area, India has skipped the phase of industrialization to move directly to the service sector. As service jobs require skilled and educated workers, rural unskilled migrants are unable to find formal jobs and are pushed into informal employment, further restricting their access to formal housing and to urban amenities. Informal settlements in the Global South have their own particular sets of characteristics. In South Africa, for instance, they are termed ‘townships and informal settlements’ and are located on the periphery of towns or cities. During the period of apartheid, these were residential areas for non-white residents (Writer, 2016). In China informal settlements are called ‘urban villages’ (Wang et al., 2009) whereas in India they are known as ‘census towns’ (Pradhan, 2013). Urban villages are also identified in India. Pradhan (2013) has estimated that the number of India’s census towns grew from 1,362 to 3,894 in the period 2001-2011 while the total population living in such census towns went up by 30%. Several studies have identified the growth of urban villages in China (refer Hao, 2012; Zheng et al, 2009). A recent World Bank report edited by Mahajan (2014) found that more than half of South Africa’s urban population are living in townships and informal settlements.